It is time for yet another book review! 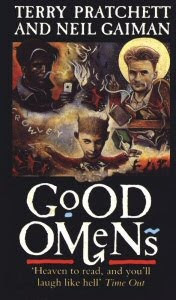 The book in question is Good Omens (The Nice and Accurate Prophecies of Agnes Nutter, Witch) by Terry Pratchett and Neil Gaiman. The world is going to end soon; next Saturday, to be precise, right after tea! Anathema Device is a witch. Newton Pulsifer is a witch hunter. They team up to stop the Apocalypse that the seventeenth century prophetess, Agnes Nutter has predicted in her Nice and Accurate Prophecies (where nice means precise). And they aren’t the only ones. While a whole lot of people, including the Four Horsemen (Bikers) of the Apocalypse are out to track the Antichrist, somewhere an 11 year old boy is naively using powers he doesn’t know he possesses to change the world according to his will. Before you know it, you are transported into a zany, faced-paced, indescribably awesome world, full of characters so surreal; they might as well walk right out of the book. Who knew the Apocalypse would be so funny! Aziraphale stared out at the rushing hedgerows. "It all seems so peaceful," he said. "How do you think it will happen?" "Well, thermonuclear extinction has always been very popular. Although I must say the big boys are being quite polite to each other at the moment." said Crowley. "Asteroid strike?" said Aziraphale. "Quite the fashion these days, I understand. Strike into the Indian Ocean, great big cloud of dust and vapor, goodbye all higher life forms." "Doesn't bear thinking about it, does it," said Aziraphale gloomily. "All the higher life forms scythed away, just like that." The book is 'ineffable'. That’s what it is. Crowley cracks me up every damn time. Neil Gaiman FTW! Yep, Crowley's awesome! But I also love it when Aziraphale acts like all meek and guilty!! !